The Stingers are going into next season with uncertainty on both the offensive and defensive side. The 2015-16 edition of the Concordia Stingers can be appropriately summed up in one word: transition. The team introduced 14 new players, and despite having such a young squad, the Stingers made the playoffs. However, a few players won’t be back next season which has led to some big questions. The Stingers will be without captain Olivier Hinse next season. Photo by Melissa Martella. Where’s the offense going to come from? This past season, one of the bright spots for the team was goal production. The Stingers were 11th in the CIS with 3.64 goals per game and 103 goals for. However, their two biggest point producers are not expected to be back as both captain Olivier Hinse and forward Jessyko Bernard are set to graduate. The leading candidate to supplement the scoring is forward Frederic Roy, who finished the year with 22 points and looks like an ideal candidate for captain. Forwards Scott Oke and Philippe Hudon both finished the season with over 20 points and will be expected to pick up the slack. The Stingers will have to look to one or two more forwards to score more than 20 points to maintain their point production from this past season. They will also need to look at generating more offense from the point, as defenceman Anthony Cortese was the team’s highest scoring blueliner with eight points. Who steps up on defense? The team was last in the entire league last season in goals against with 112. This was due to defensive breakdowns by both the forwards and the defensemen in their own zone. However, their lack of point production is another area where the team is going to need to improve. Other than Gabriel Bourret and Alex Macdonald, the other six Stingers defensemen last season were playing in their rookie seasons. Both will surely be relied on to lead the way as seniors and the coaching staff will no doubt be looking for signs of improvement from the sophomores. Who grabs the number one goalie position? Miguel Sullivan had a terrific end to the season for the Stingers and looks poised to be the Stingers number one goalie next season. However, Robin Billingham was in a similar position last year in training camp. 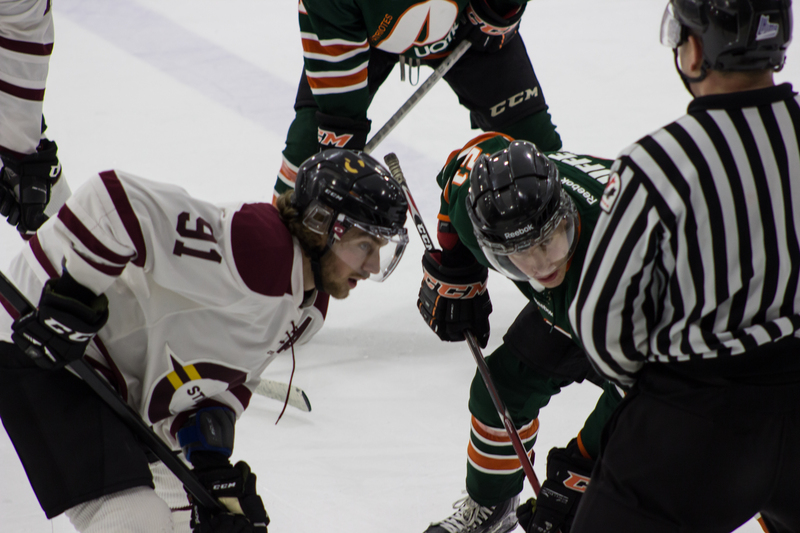 Billingham lost his spot later in the season as coach Marc-André Element decided to go with the freshman Sullivan in the last two games of the season as well as the playoffs. Both goalies had subpar seasons as they finished with save percentages below 90 per cent. However Sullivan had the better record at 8-7 and should have the inside track on the job as Billingham had a record of 2-10. No matter who takes the starting role and runs with it, the Stingers will have to improve on their 88 per cent save percentage—the worst in the league—and 3.94 goals against average to have any chance of putting together a winning season next year. A glaring question with no real answer. At this moment no one’s entirely sure who will be behind the bench for the Stingers next year. Will coach Element be back? Will there be changes made to the coaching staff? This is a decision that needs to be made as quickly as possible as it is crucial if the Stingers want to gain a leg up on recruitment and create a clear vision for what is expected of this team next season. If the team can build on what they did right this past season, there is no denying that the team can make a run for the playoffs.